NZXT delivers the Phantom 820, a new big-tower case with integrated hue lighting that focuses on "maximum cooling potential". The case features a front door that hides four 5.25" drive bays, and inside there are five 3.5/2.5" bays and nine expansion slots. Integrated into the case is a four channel digital fan controller with 15W per channel, as well as a I/O panel with two USB 3.0 ports, four USB 2.0 ports, an SD memory card reader and audio ports. 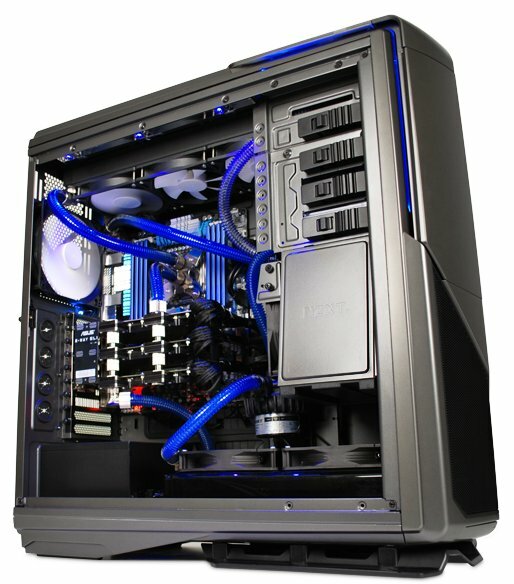 An acrylic window provides a view into the case, and inside is one 140mm fan and three 200mm fan to provide lots of airflow to your hardware. A total of nine fans can be mounted inside the case, and you can mount a triple-radiator in the top as well as a 240/280mm unit in the floor of the case. The case will ship by the end of November for 249.90EUR, it will be available in white, black and gunmetal editions. NZXT starts a new chapter in the Phantom saga with the Phantom 820. The feature rich big-tower chassis with a four channel fan controller, multicolor LED lighting and futuristic design takes the elaborate look and feel of the Phantom series to new heights. Card reader and lighted motherboard back plate aid in every day operation. With up to nine installable fans, all of which controllable, the Phantom 820 is the best choice for both enthusiasts and silent computing users. To improve on a high-tech chassis like the extremely popular Phantom may seem an impossible task. NZXT answers this question with a loud and resounding yes. The Phantom 820 offers the incredible genes of the previous generation, but includes a long range of improvements and additional features along with even more futuristic design elements. These extras encompass a unique stand all the way up to multicolor LED elements. The Phantom 820 is available in various color choices like matt black, white and gunmetal. Just like the original, or the smaller Phantom 410 variant, the new 820 unit is a beauty to look at. It offers the same incredible asymmetrical shape with homogeneous lines along with larger dimensions. Front and top of the Phantom 820 are similarly shaped in a mirrored fashion to be the proper successor of the original. Viewing the big-tower from the front, one can see the two segments of the chassis. The pointy front houses a door in the top halve, behind which four 5.25 inch drives with mesh covers are hidden. On top of that, an SDHC card reader and the NZXT HUE equipped controls for the elaborate LED lighting. Thanks to the underlying technology, you may change the color and lighting theme seamlessly. An additional button in this area gives control over the white LEDs which light the motherboard expansion slots and the board backplate area. Below the external drive bays a fan is used to push cold air across the internal hard drive bays. The case controls, along with the audio I/O and fan controller can be found on the right side of the top panel. The fan controller utilizes four separate channels, each of which can handle up to 15 Watt. An separate button combines all individual channels into a single one to be controlled uniformly. On the left edge one will find the six USB ports, two of which are 3.0 variants. 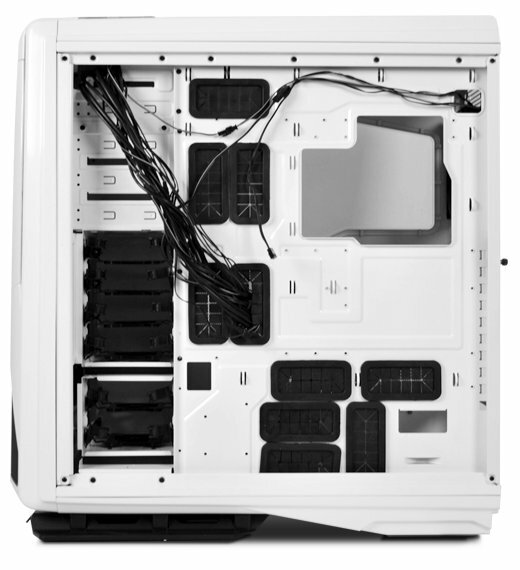 The interior of the NZXT Phantom 820 is painted to match the outside of the chassis. A very large motherboard tray with big openings below the CPU area enables the easy exchange of CPU coolers and an quick and simple assembly. Due to the large dimensions, the chassis can hold XL- or E-ATX motherboards along with long graphic cards with up to 33.3 cm length. Thanks to perfectly placed cable routing openings and plenty of space between motherboard tray and side panel, keeping the interior tidy even when using a large number of components is possible. The HDD or SSDs may be installed in beautifully designed cages, while the bottom one is easily removable to be filled outside of the chassis. Besides 3.5 inch drives, one may also place 2.5 inch units into any of the drive bays. Above the cages are the four 5.25 inch bays, each equipped with a tool-less locking mechanism. Newly designed case feet make the Phantom 820 even bigger and add another futuristic design element. The bottom mounted PSU bay features rubberized elements to eliminate any vibration from this area. A window allows some insight into the beautiful chassis, giving the user the possibility to show off the installed components. A large 200 mm fan in the front draws cool air into the chassis, while a rear 140 mm unit pushes warm air out, creating an efficient air flow within the Phantom 820. Thanks to the elaborate design, the chassis offers seven additional placement possibilities. The top offers multiple configuration possibilities, allowing the user to choose from a single 200 , two 140 or three 120 mm units. The position of the rear 140 mm unit may be adjusted vertically, giving the user the utmost flexibility regardless if air or water cooling is used. Two further placements for 120 or 140 mm fans can also be found on the floor of the chassis. Such an extensive cooling solution requires a potent controller to give the user the flexibility by adjusting the speed and noise level within the chassis. Each of the individual channels also allow for the fans to be completely deactivated. All intake areas of Phantom 820 are protected by dust filters, to keep dirt and grime away from the valuable components inside. Thanks to the large volume of the chassis, the Phantom 820 allows for triple radiator to be placed within the interior with up to 60 mm height. In addition to this, another 240 or 280 mm unit may be placed on the floor of the case, allowing for unprecedented cooling possibilities.